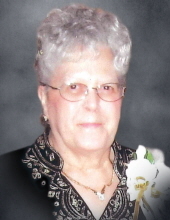 Karen A. Kazik, 76, De Pere, passed away peacefully Saturday, February 9, 2019, surrounded by family. She was born February 27, 1942 to Joseph and Gertrude (Monfils) Charles. On October 21, 1961 she married Ervin “Butch” Kazik. Karen retired from K-Mart after 30 years. She and Butch enjoyed camping, bowling and traveling together, but it was the time spent with her children, grandchildren and great-grandchildren that meant the most to her. She is survived by her husband, Butch; children, Mary Jo (William) Krahn, Christine Kazik and Theresa (Rick) Roskom; grandchildren, Barry (Gina), Rachel (Kevin), Eric, Joseph, Paul (Ashlee), Misty (Joseph), Tiffany, Shannon (Stephanie), and 10 great grandchildren. Karen is further survived by her siblings; Marvin (Janice) Charles, Don (Jill) Charles, Judy (Bob) Gallagher, and Diane (Dennis) Opicka. Butch’s family as well as numerous nieces and nephews also survive her. She was preceded in death by her parents, her son Kevin Kazik, as well as her siblings; Myron, Joyce, Lee, and her in laws Ervin Sr. and Elsie Kazik. Friends may call after 3:00PM Thursday February 14, 2019 until time of service at 7:00PM with Deacon Don Coenen officiating. Entombment to take place at Ft. Howard Memorial Park. Please go to www.ryanfh.com to send online condolences to the family. To send flowers or a remembrance gift to the family of Karen Kazik, please visit our Tribute Store. "Email Address" would like to share the life celebration of Karen Kazik. Click on the "link" to go to share a favorite memory or leave a condolence message for the family.